This past weekend it was so hot, not even grilling was an option. Now it’s a cool 74 degrees, but the temperature is supposed to climb again. Think proactive, like stocking a fallout shelter with canned goods. Add this recipe to your arsenal and you’ll be eating well and keeping cool through the next heatwave. On Saturday I remembered a cold cucumber and zucchini soup I made years ago and dug up the recipe, which was originally printed in Gourmet. Earlier that day, I’d had a conversation at the greenmarket with Hardeep about how he makes his raita. 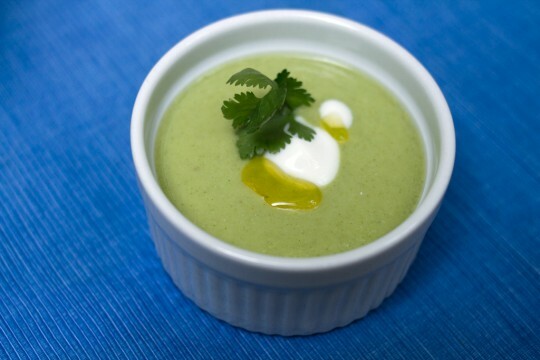 Freshly stocked with cucumbers and inspired by the thought of that refreshing, spicy dish, I decided to spike the soup with cumin and use yogurt as a base. In a blender or food processor combine the cucumber, zucchini, shallots, chili, vinegar, water, spices, salt and sugar. Blend until very smooth. Transfer to a bowl and whisk in the yogurt. Taste for seasoning and refrigerate to chill for at least 30 minutes. Serve garnished with a drizzle of olive oil and a bit of chopped cilantro. Makes about 4 cup servings. No matter the temperature outside, this soup is not only delicious, but has all the rich vitamins and benefits of raw food. I also love how the zucchini skin turns the soup a beautiful green color. Oh, yes! I’m making this for the weekend! I’ve refused to use the stove for about two weeks now, so this fits right into my summer eats plan. Sounds delicious! Good! Stoves are the devil right now. Even just a few minutes with a burner on can raise the apartment temperature for the rest of the night!